There are numerous barriers exists at community level for optimal uptake of PPTCT services. 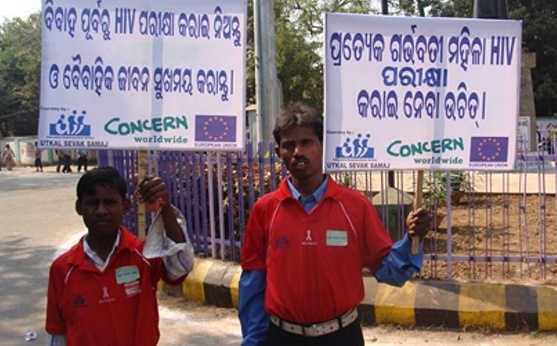 Utkal Sevak Samaj works within communities to address these barriers and enhance service use that is increasing rates of PPTCT enrolment, retention in care and successful treatment. The PPTCT services provided access to all pregnant women for HIV diagnostic, prevention, care and treatment services. These include counselling and HIV testing of all pregnant women enrolled into antenatal care (ANC). Mothers are counselled on infant feeding options and family planning. The project ensures involvement of spouse and other family members for care and support. Linkages are forged with VCTCs, ART clinics and other district-level hospitals, promotes lifelong ART to all pregnant women regardless of CD4 count and clinical stage. The project promotes institutional deliveries of all HIV infected pregnant women, provision of ARV prophylaxis to infants from birth up to minimum 6 months. It also provides nutrition counselling and psychosocial support for HIV-infected pregnant women, strengthen community follow- up and outreach through local networks to support HIV-positive pregnant women and their families. Primary prevention of HIV, especially among women of child bearing age. Preventing unintended pregnancies among women living with HIV. Prevent HIV transmission from pregnant women infected with HIV to their child. Provide care, support and treatment to women living with HIV, her children and family. 1456 antenatal cases registered and referred to ICTC & PPTCT for HIV test. 25 pregnant women and 3 children found positive. 38 support group meetings and 54 meetings with health workers organised participated by 945 people. The outreach workers visited 89 families and provided at home counselling services. Cuttack, Bolangir, Angul, Balasore, Bhadrak District of Odisha supported by IL&FS Educations and Technology Services Ltd., New Delhi. In Balasore District, During the Month of April-15 One Case was found by our ORW in the Khirokona Village of Simulia Block who was a Positive Pregnant women and her status was unknown to the ASHA didi of concerned village and other village Members. She admitted in the District Head Quarter Hospital of Balasore by the Support of our ORW SujataBiswal, where She delivered a child in the hospital with all institutional care. She administered NVP and same was provided to her New Born In the meantime ASHA didi of her village came to know about her status during Post Natal Care. She disclosed her status to her family members, villagers and AWW of that village. When she returned to Anganwadi Center of her village for Immunization of her child she was Stig-matized and discriminated and the New born baby could not be Immunized. Even she faced discrimination by the Villagers and Members of her Family Family. She kept Isolated. The Community did not accept her as Normal One. She was frustrated, shocked, and depressed. In the meantime she communicated the same to our ORW for Help.Then the ORW discussed the matter in the office. We reached that Village along with other people with HIV to sensitize the Community. We called Ward Member, Sarpanch, ASHA didi, AWW, School Teacher Informal Village leader, all family mem-bers & other villagers for solution of this Sensitive issue. We made them understand the facts re-lated to HIV/AIDS, How it spreads and how does not by using posters, leaflets and showing them other Audio Visuals. We also discussed about the misconceptions towards HIV/AIDS and Human Right issues related to it. Gradually, everyone started talking in favor of her and assured to provide all possible support. She was accepted by the community and she is now leaving happily without suffering from Stigma and Discrimination, We are also in regular touch with her to ensure regular support. Sarapanch is also planning to involve her in various Government Schemes.